Each coupon redeemed provides our clients more social shares and sales, all of which we send directly to the account owner (you). There are no additional fees associated and when the user redeems the offer it's as if they are on your own website. We simply are presenting your offer in a safe, affiliate free marketplace. Our desire is to help our clients fend off affiliate driven coupon websites. When users leave your website to hunt for coupons, there is an entire market working to capture those users and use an affiliate cookie to cut into your margins. 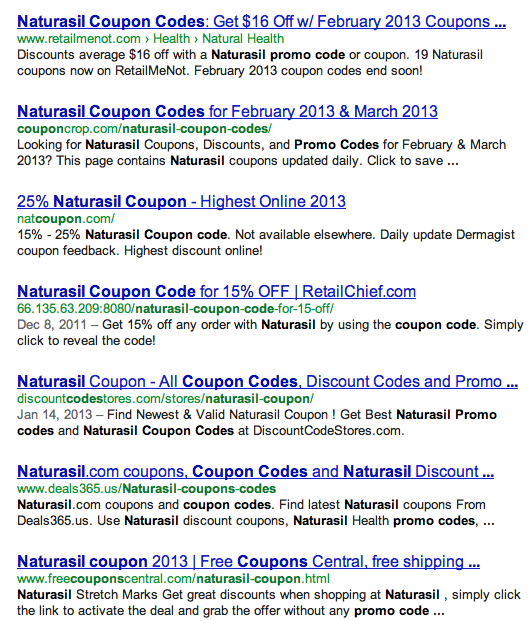 In the following graphic you can see what happens if a shopper is on Naturasil.com and decides to search Google for a coupon (result for "naturasil coupon codes" below). With some strategizing on the SEO front, our goal is to outrank these websites and limit the affiliate fees you risk paying out when customers leave your website to go coupon hunting. Keep in mind this is just another level of insurance as you're already presenting coupons on-site directly to visitors while they shop using our Social Incentive Widget.